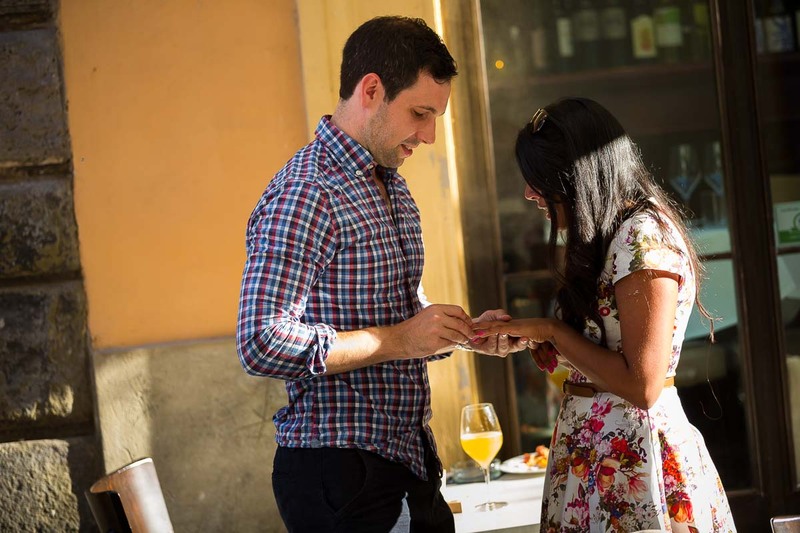 Piazza Navona was the area chosen for this romantic marriage proposal in Rome. Our meeting point was underneath the statue of Rio de la Plata contained in the Fontana dei Quattro fiumi. A unique statue resembling a frightened statue with the left hand raised as if to guard against the collapse of the nearby church of Sant’Agnese in Agone. 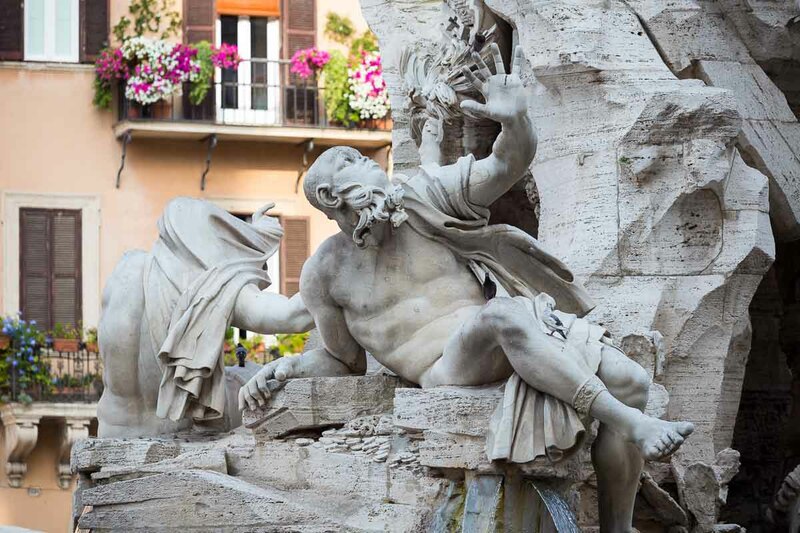 Just a popular belief of the rivalry between the two architects Bernini and Borromini as the fountain was built before the church. 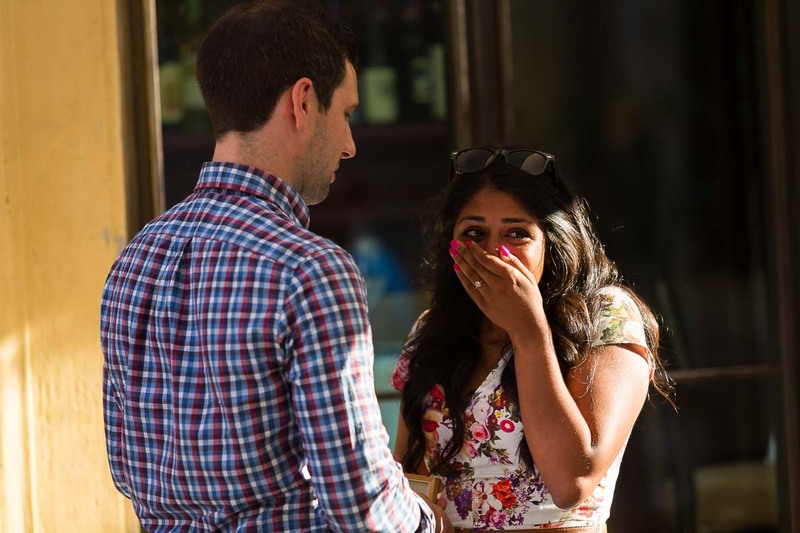 The Piazza was too crowded for an intimate proposal. So after making eye contact I followed them as the search for more a secluded place began. We walked around a little bit through little alleyways in around Bar della Pace. Then found a small side table outside a bar that looked just right for asking the big question. I took position on the other side of the street as they sat down and ordered something to drink. It was tricky to find out exactly when it was going to happen as I was at a distance. So I had to keep my eye on the scene without seeming present. When the moment was right I was ready to photograph! Much surprise and happiness followed as I tried to photograph the moment as best I could while people were walking past in between us. Some stopped. Others were asking me questions as I was taking the photographs! Nonetheless the result was a joyful and spontaneous moment! 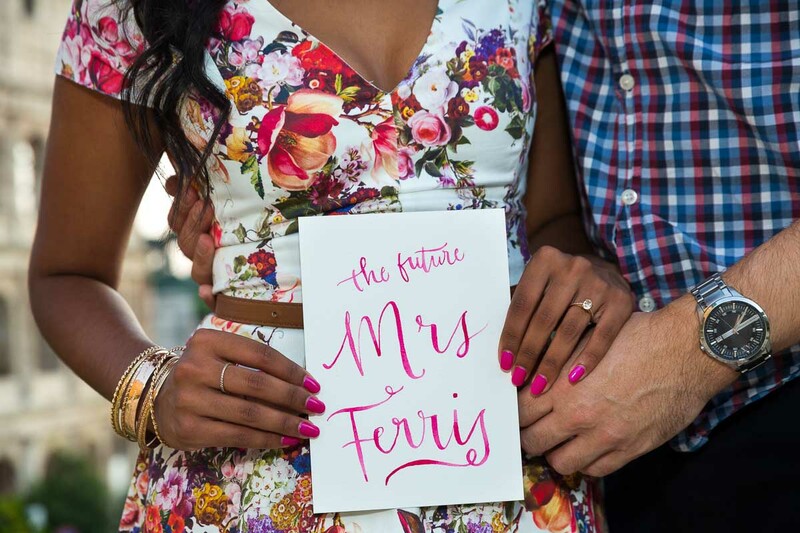 A great engagement session followed. We began by taking some pictures back at the Fountain of the Four Rivers. We also had some hand made cards; some cute wedding proposal ideas that we used in some of photos. Then we took a taxi to the Roman Colosseum where we took some nice images with the landmark as background. Then it was off to Piazza del Campidoglio to complete our photo session with a stunning view over the ancient Forum. We took some last images on beautiful long stairs and inspiring columns and lastly in the piazza as the sun had by now gone down. Thank you and wishing you all the happiness in the world! 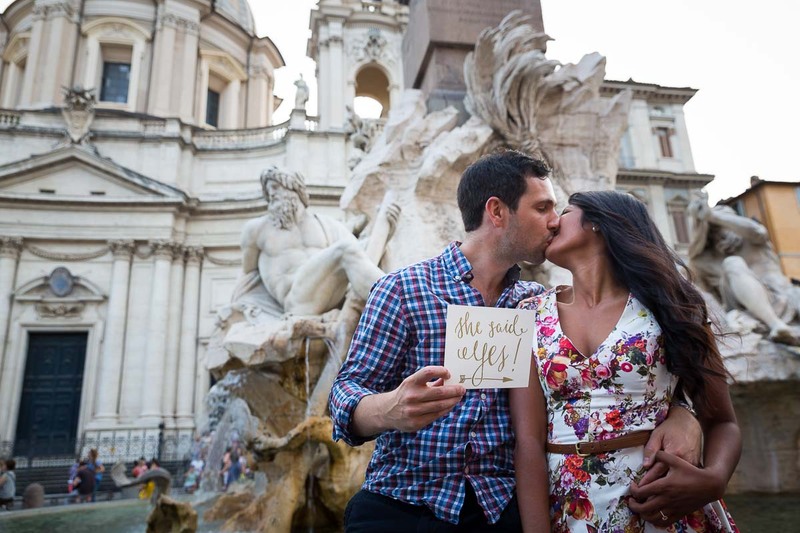 Check out more imagery from other photo shoots in Rome for more cute wedding proposal ideas from the Blog. 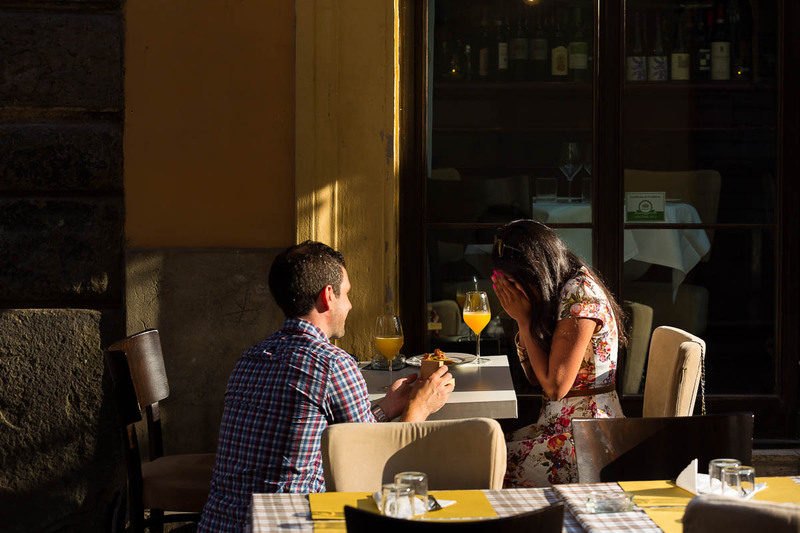 Proposing in Rome. 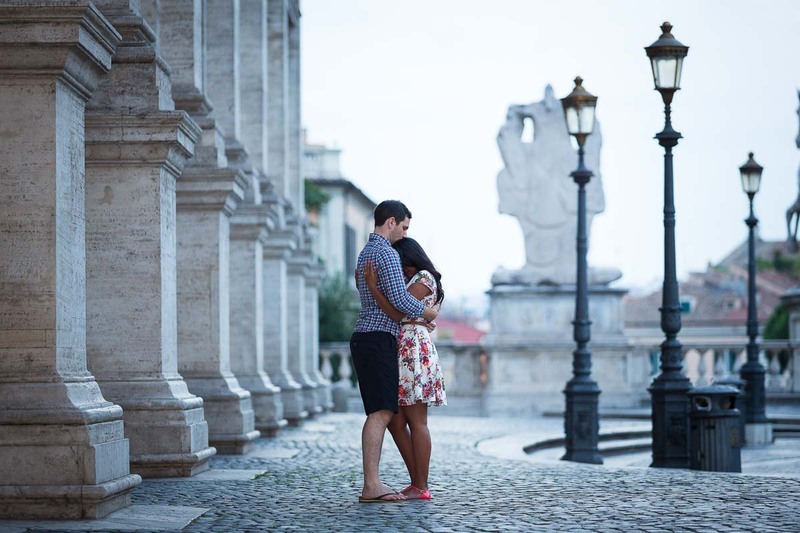 A romantic couple photoshoot in the alley streets followed by an engagement session at the Coliseum and overlooking the roman ruins in Piazza del Campidoglio.